Geoscience Australia: What is a Volcano? "the largest erosion caldera in the southern hemisphere." Regional satellite image © copyright GeoScience Australia reproduced with permission. This now extinct volcano and the associated landscape complex has several names in common use. You may see it referred to in literature as the “Mount Warning Volcano”, “Tweed Volcano”, “Mount Warning Shield Volcano”, the “Tweed Caldera”, the “Tweed/Focal Volcano series”, and in World Heritage literature - the “Border Group” or "Tweed Volcano Group". Australian Tourism has declared it to be a Landscape of National Significance and dubbed it "Australia's Green Cauldron", under the National Landscape program, launched locally on 10 June, 2008. 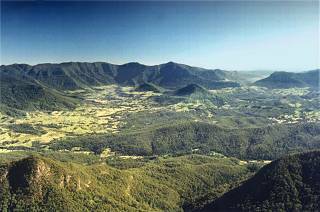 The huge size of the Tweed Valley, the caldera of the Mt Warning shield volcano, gives us an inkling of what a monster the volcano was. Today the caldera valley is over 1000 meters deep and has a diameter of over forty kilometres, making it larger even than the famous Ngorongoro Crater in Tanzania. Tweed Valley Photo © Inter-Action Pty Ltd, Greg Smith. What the heck is a caldera anyway? To vulcanologists a caldera* is a bowl shaped depression caused by the collapse or erosion of a volcanic cone. The biggest erosion caldera in the southern hemisphere, and one of the largest calderas in the world, it is one of the world's great natural wonders. It is also one of the few places where the erosion process can be seen to the underlying pre-volcanic sedimentary and metamorphic	rocks, providing enthusiasts with a wonderful opportunity to test their	knowledge	of geological processes. 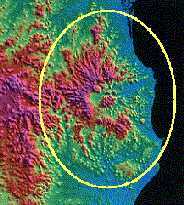 *Caldera: Large depression commonly formed by collapse of the ground following explosive eruption of a large body of stored magma. (USGS). Moving over a hotspot in the earth's crust about 23 million years ago, the volcano erupted through the Brisbane Metamorphics Series which are 250 - 500 million years old, and spread out over the Clarence - Moreton Basin sedimentary floor, which was laid down 135 - 200 million years ago. When the volcano finished it's eruptions about 20 million years ago, it had risen to a height of over 2 kilometres, and layers of lava and ash had been deposited over its outward slopes, to a diameter of about 100 kilometres. 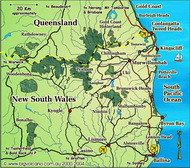 This spread the volcano out over an area from Byron Bay in the southeast, and Lismore in the southwest, to Mount Tamborine to the north in QLD. Over the past 20 million years the vast majority of the material ejected has been eroded away by time and weather, and the effect of the many minor creeks and tributaries, including the Rous and Oxley rivers, feeding the Tweed River as it winds its way across the valley floor and eventually enters the ocean at Tweed Heads. What remains is still mighty impressive. Considered the central magma plug, Mt Warning and a system of ring dykes, being extremely hard rock, have resisted erosion, and dominate the valley landscape, especially in and around the township of Murwillumbah. The rim of the caldera has been protected by a cap of very hard basaltic rock, forms a virtual semi circle of vertical cliffs around the western side of Mt Warning, which now stands at just over 1100 meters tall, and is increasingly known by an aboriginal name - "Wollumbin". Sugar cane, cattle and dairy farming make use of much of the rich post glacial alluvial deposits on the caldera floor, but the heights are protected by their inaccessibility and World Heritage listing of five National Parks. Contrary to popular belief, Mount Warning isn't the first place in Australia to "see the sunrise" each day, but being so high and so far east on the Australian coast, it is the first peak on the mainland to be touched by the rising sun at the Autumn and Spring equinoctes#. Where does the sunrise first on the Australian mainland? It depends on the time of year and how far south and east you are. But Cape Howe in VIC is generally considered the most likely candidate on New Year's Day. Find out Sunrise, Sunset and Twilight times for any Australian location courtesy of Geoscience Australia. *Official height 1156 metres (3,793 ft), Summit elevation 1125 m.
Mount Warning National Park: NSW National Parks and Wildlife Service 1993. Bushwalking in North-East New South Wales: Rob Blanch and Vince Keen, Atrand Pty Ltd 1989 ISBN 0 908272 24 3.